Gertrude Elizabeth Krieg was born on 25 Sep 1897 in Pennsylvania. On the 1920 census, Gertrude was 21 years old, born in Pennsylvania. She was living with her husband and son, Frank F. (6 months), at 40 Lehigh Street, Wilkes-Barre, Luzerne, Pennsylvania. In the 1930 census, Gertrude was 32 years old. She was married at age 20 years. She lived at 40 Lehigh Street, Wilkes-Barre, Pennsylvania with her husband and 4 children. She died on 25 Feb 1985 in Wilkes-Barre, Pennsylvania. 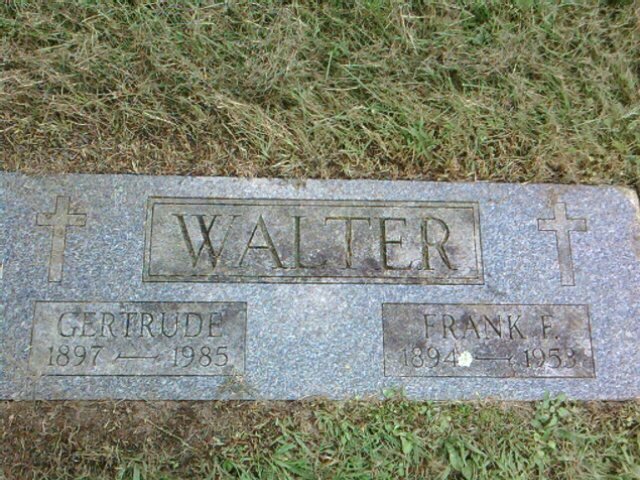 Gertrude E. Walter, formerly of 77 S. Hancock St., Wilkes-Barre, died Monday (25 Feb 1985) in General Hospital. A life resident of Wilkes-Barre, she was the daughter of the late Frank and Julia Marley Krieg. Mrs. Walter was a member of the Parsons Veterans of Foreign Wars Auxiliary and was active in veterans auxiliary affairs and as a volunteer at the Veterans Administration Medical Center, Plains Township. She was a member of St. Nicholas Church and its Altar Rosary Society. Her husband, Frank, died in 1953. Surviving are sons, Francis, Toms River, NJ; John, Liverpool, NY; Fred, Hanover Township; daughters, Ruth Walter, Wilkes-Barre; Mrs. Edward (Dolly) Baranowsky; Mrs. Bernard (Helen) Schneider; Mrs. Michael (Claire) Krafjack, both of Falls, PA; 29 grandchildren and several great grandchildren. Funeral will be Wednesday at 9 from the Walter W. Lisman and Son Funeral Home, 233 S. Washington St., Wilkes-Barre. Mass of Christian Burial will be at 9:30 in St. Nicholas Church with interment in the parish cemetery, Shavertown. She was buried on 27 Feb 1985 in St. Nicholas Cemetery, Shavertown, Pennsylvania.